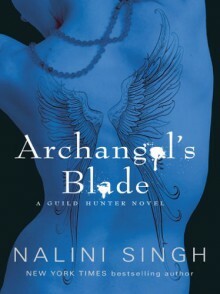 New York Times bestselling author Nalini Singh is back in the shadows of a deadly, beautiful world where angels rule, vampires serve, and one female hunter must crawl out of the darkness to survive . . . The severed head marked by a distinctive tattoo on its cheek should have been a Guild case, but dark instincts honed over hundreds of years of life compel the vampire Dmitri to take control. There is something twisted about this death, something that whispers of centuries long past . . . but Dmitri's need to discover the truth is nothing to the vicious strength of his response to the hunter assigned to decipher the tattoo. Savaged in a brutal attack that almost killed her, Honor is nowhere near ready to come face to face with the seductive vampire who is an archangel's right hand, and who wears his cruelty as boldly as his lethal sensuality . . . the same vampire who has been her secret obsession since the day she was old enough to understand the inexplicable, violent emotions he aroused in her. As desire turns into a dangerous compulsion that might destroy them both, it becomes clear the past will not stay buried. Something is hunting, and it will not stop until it brings a blood-soaked nightmare to life once more . . .